In Catalonia, they call it “vi de pagès”. Literally, this means “peasants’ wine” and honestly that doesn’t sound terribly appetizing. But, a better translation to understand the whole process in English is “natural wine”. That’s a bit of a loaded term as well, especially given how the debate is ongoing as to whether its good, bad, or even needed. The big difference with the wineries that we recently visited in Calonge (a small town in Baix Empordà, Catalonia, Spain) is that there is nothing new in how they are making their wines. They’re not “rediscovering” natural wines. It’s been going on for literally centuries and while their contemporaries have slowly been converting over to modern production methods (stainless steel tanks, controlled fermentation, etc.) they’ve stuck by the old methods. Take Mas Molla. In their family house they’ve been making wine pretty much the same way for the last 700 years or so. Naturally, they update the oak barrels as needed and use automated de-stemming machines, but that’s about where the modernization stops. Monste Molla, the current winemaker and first woman in the family to do so, uses natural fermentation to make the wines. This means that she doesn’t add additional yeasts to start fermentation. The disadvantages in this is that she never really knows when it will start and when it will end. While there is no such thing as a hand’s off approach to winemaking, this method means not only do they have to watch the wines very closely, but to know when to blend the wines as the different barrels will ferment at different rates from one to another. Another winery that’s similar to Mas Molla is Mas Ponsjoan. Their properties border one another and Manel Comas makes wines in much the same ways as Montse. The big difference is that while she has the background of studying commercial enology, Manel makes wine the same way his family has been making it for the last five generations in the farmhouse, having passed the skills down from generation to generation. 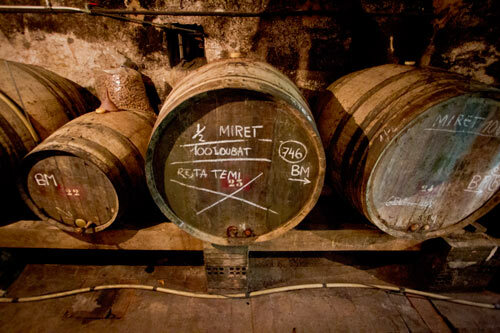 They also let their wines ferment and age naturally. They don’t even irrigate the vineyards. Of course, the proof is in the bottle. Do these methods produce a superior wine? 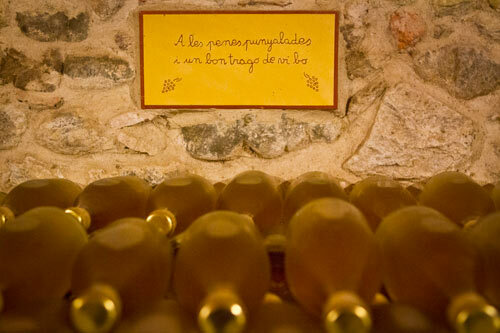 Both Mas Molla and Ponsjoan produce very good wines. Tossed in to this is the fact that because they are outside the Denominació d’Origen (DO) their wines are unlabeled and not certified like others are and thus are at very, very good prices. As referenced in the first part of this article, the debate rages as to whether natural wine production is a better form of production. There are several elements that you notice in these wines though. As they are less adulterated, you do taste the locale more and the depth of the grapes are more present. This isn’t to say that you can’t achieve this with modern production methods, it’s just that it’s often not the case as modern production is used to makes wines more consistent. And that is one of the downsides/great joys of this style of winemaking in that every vintage has a distinct character. Even bottles can differ from one another to some degree. That’s an enjoyable way to drink wine and if the winemaker knows what they’re doing like Montse, Manel, and the 19 other “vi de pagès” wineries in Calonge do, you’ll get a good bottle of wine. Of course, it’s easy to have a skunky year as well that then won’t have all the modern mechanisms needed to correct it. It is the case that this process probably won’t live on forever as it’s difficult, unpredictable, and not nearly as lucrative as being in the DO given that if you are making an unlabeled, non-certified wine, charging more than 3€ a bottle or 1€ a liter for bulk in Spain’s wine market is difficult. But, as it sits, it’s one of those few old methods that hopefully won’t be lost for some time and should be visited if one is in the area. do you have one importer of your wines in holland? This is just a digital magazine for wine, so we don’t make any of these. But, more importantly, they’re unlabeled and not certified, so even if the wineries were looking for an exporter, it’s doubtful the Dutch authorities would allow it.